Queen’s biopic, “Bohemian Rhapsody”, has been nominated for five Oscars – including Best Picture – at next month’s 91st Academy Awards. 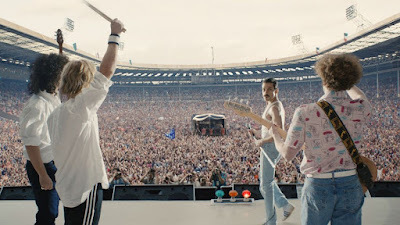 Directed by Dexter Fletcher, the film – which follows Queen from their creation in 1970 through to their legendary 1985 Live Aid appearance – is a finalist for Best Picture, Sound Editing, Sound Mixing, Film Editing, and Best Actor for Rami Malek's portrayal of Freddie Mercury. To view the full list of 2019 Oscar nominees, click here. The 91st Academy Awards will be broadcast live on Sunday, February 24 at 8 p.m. ET/5 p.m. PT on the ABC-TV network. "Bohemian Rhapsody" has become the highest-grossing musical biopic of all time, with worldwide box office revenue of more than $700 million. Earlier this month, the project was named Best Motion Picture (Drama) at the 2019 Golden Globe Awards, while Malek was honored as Best Performance By An Actor In A Motion Picture (Drama). In sync with the Oscars announcement, Queen released an expanded home edition of “Bohemian Rhapsody” on digital, and it will be available via 4K Ultra HD, Blu-ray and DVD on February 12.